Invented over 50 years ago by the famous Danish poet and scientist Piet Hein, the seven pieces of this cube can form the basis of literally thousands of three dimensional forms. An excellent introduction to both constructional puzzles and packing problems. A smaller version of # 371 but like it’s big brother comes encased in box/lid and supplied with a comprehensive diagramatic selection of starter puzzles to be attempted. A 64 piece version of one of our most popular puzzles. More than twice as large and certainly many more times as difficult it’s bound to prove to be a real challenge to all those who attempt it and should not be confused with it’s addictive, much simpler, little brother. An extra large version of our most popular puzzle. The edges of each individual cube are attractively chamfered. The most amazing cube since ‘you know what’ and an instant hit with people of all ages. It’s so tactile you’ll never want to put it it down. One of our best selling items. A smaller version of # 374 and we have to admit, not so nice to handle but still great value and easily carried. A great stocking filler at Christmas. A mico sized version of our Bendi puzzle with an attached keyring. An eight piece cube with a unique solution. Each piece has three faces that are shaped in such a way that it can only be reassembled one way. Enclosed in a case that doubles as a stand. 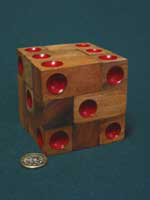 An extremely difficult 9 piece cube invented by Bill Cutler. Comes complete with a case that doubles as a stand so that the pieces may be stored whilst making an attractive ‘puzzling’ display ornament. A multi piece cube with two solutions. Comes complete with a box/lid so that the pieces can be stored away for safe keeping. An extremely difficult 25 piece cube. Comes complete with a case that doubles as a stand so that the pieces may be stored whilst making an attractive ‘puzzling’ display ornament. A very difficult 6 piece sequentially interlocking cube with just one solution. An extremely difficult six piece puzzle cube that needs you to make five separate moves before you can remove the first piece. A puzzle that will test the ability of the most expert and most definitely not suitable for beginners! A very difficult multi piece cube with just one solution. The pieces are enclosed inside a box/lid for storage. 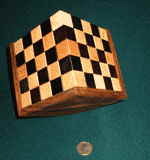 A very difficult multi pice cube discovered by Stewart Coffin. He called it ‘the half hour puzzle’ but it’ll probaly take you a lot longer! A four piece, serially interlocking, cube safely enclosed inside a box/lid. Not too difficult but an interesting construction all the same. #584 THE 25 Y PUZZLE CUBE £14.00 Take 25 of the ‘Y’ pieces that you will find in a set of PENTACUBES and attempt to assemble them together into one large cube. Box/lid. 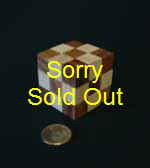 #383 2’S COMPANY PUZZLE CUBE £10.00 Invented by Proffesor John Conway, 7 small cubes of three different colours must be arranged in 2 different ways. There are 49 solutions to the first puzzle and just 1 for the second. #589 THE 25 N PUZZLE CUBE £14.00 25 of the ‘N’ pieces that you will find in a set of PENTACUBES brought together into one large cube. This puzzle that has only four solutions, once dissembled, is extremely difficult to solve. Box/lid. A dice with a difference. Made up of 9 ‘L’ shaped pieces this dice forms the basis to two entirely different puzzles. It can be built both as a red and white spotted die but the white version is much more difficult than the red. To be sucessful you’ll first have to discover why!